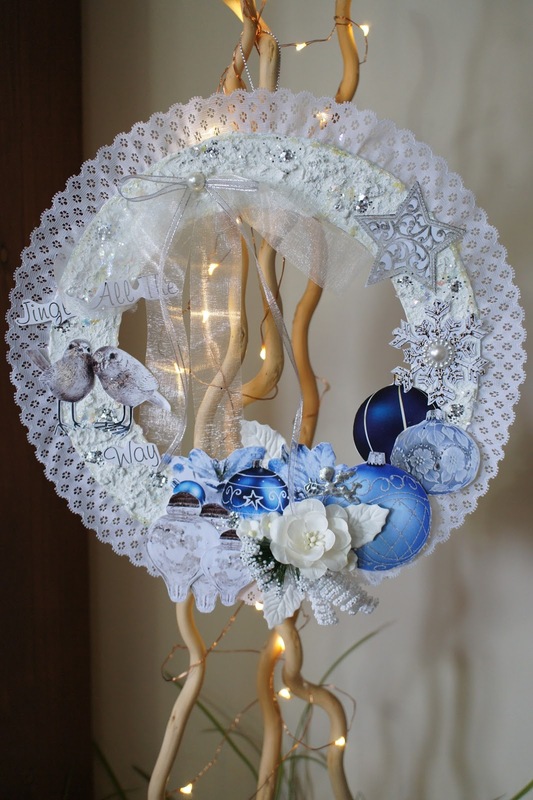 Leanne here with you today to share my latest project. A Christmas wreath using " A Twinkling Christmas" papers. I have created the base from chipboard. 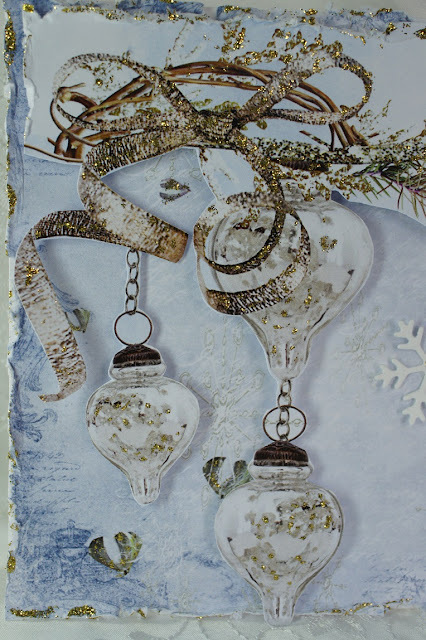 Layers of gesso & texture paste were added to the chipboard shape then allowed to dry. 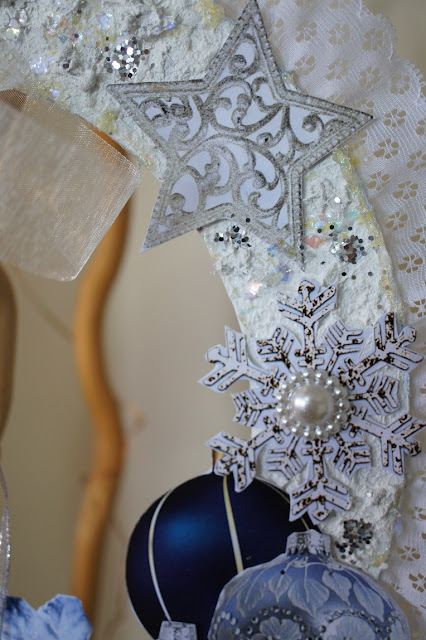 Next I applied some faux snow & silver glitter. I have fussy cut around the pretty paper pattern designs, then fixed each piece in place. 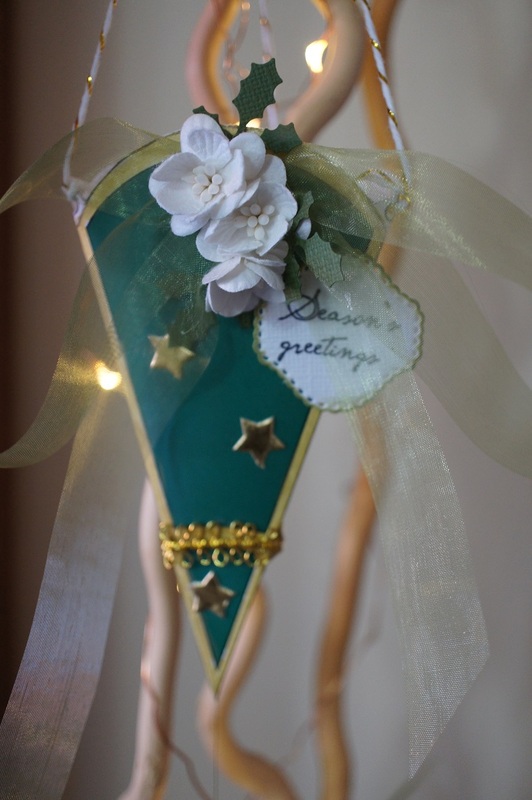 Lace, ribbon, trims, flowers & leaves were also added. Have a wonderful day & happy creating. Hello. I hope everyone is well. Its never to early to start planning for Christmas. I like to write down what presents I am buying for family and friends. My daughter , my mum and I like to plan our Christmas meals with who's coming for dinner and what will be needed. So the project I would like to show you is a ladies Christmas planner. 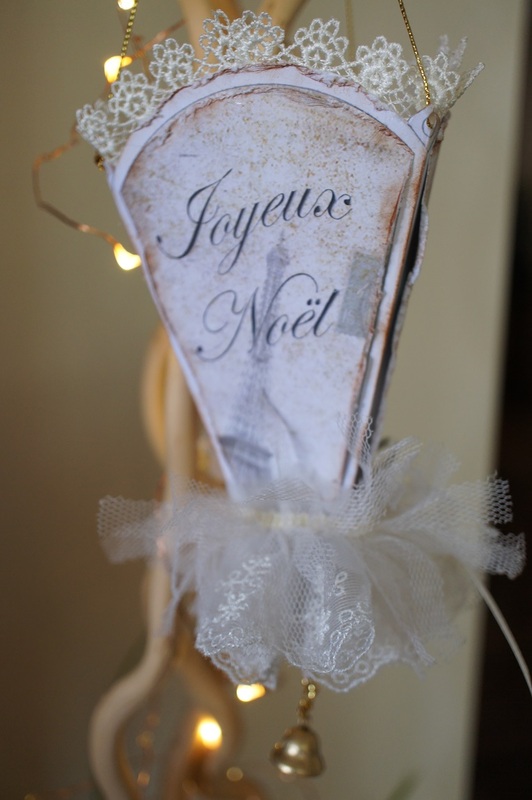 Using thick card stock I cut out a book which was half a Christmas tree and half a rectangle book. I bound the book using metal circle clips. I strongly recommend you try a project or card with the German Scrap borders and strips. 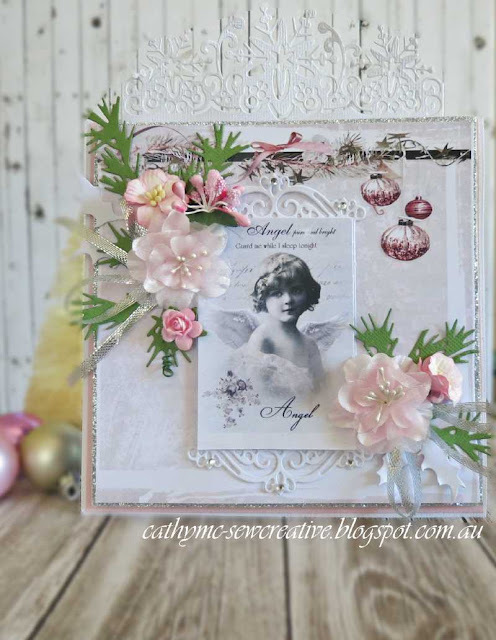 There are so many uses of German Scrap borders and strips from Megs garden. They are so detailed with the embossing and fine cut out patterns. I used the borders through out the book. Framing or high lighting each page. This makes the layout of each page flow as one theme throughout the book. Thanks for having a look at my latest project. Hello everyone! I hope that you're having a great day. 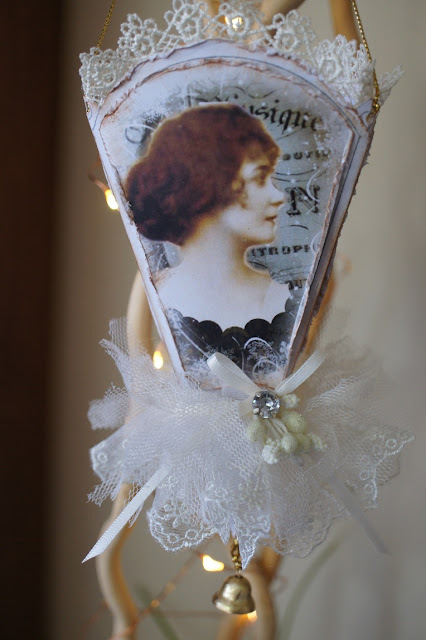 Today I am sharing two projects using papers from Meg's Garden. I have used the cardmakers pack and the Twinkling Christmas papers. You can purchase these or download them from the store. 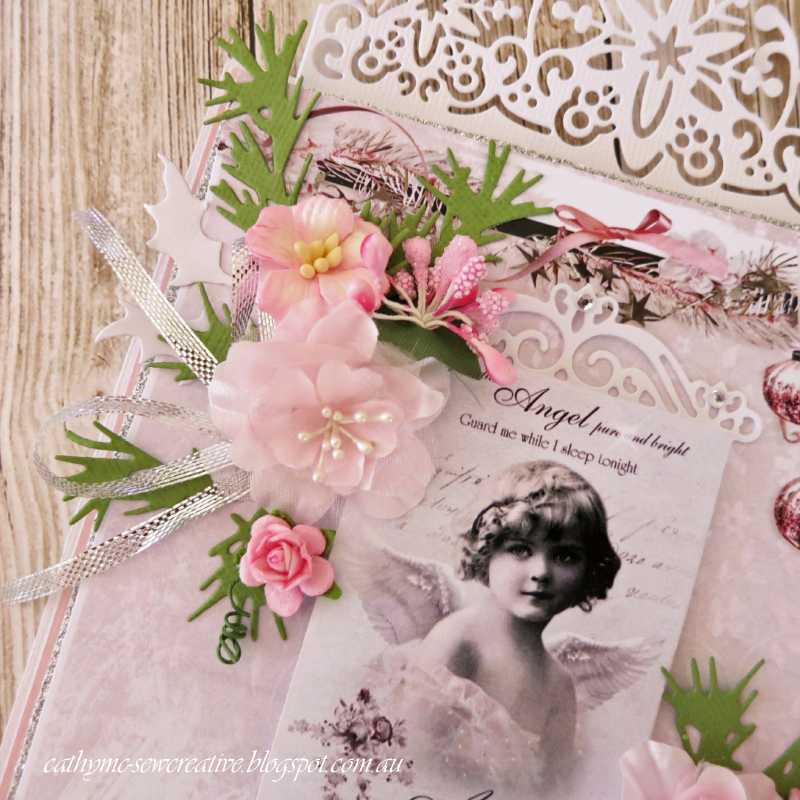 I have used some delicate border and frame dies to add a vintage/shabby chic touch to my card. 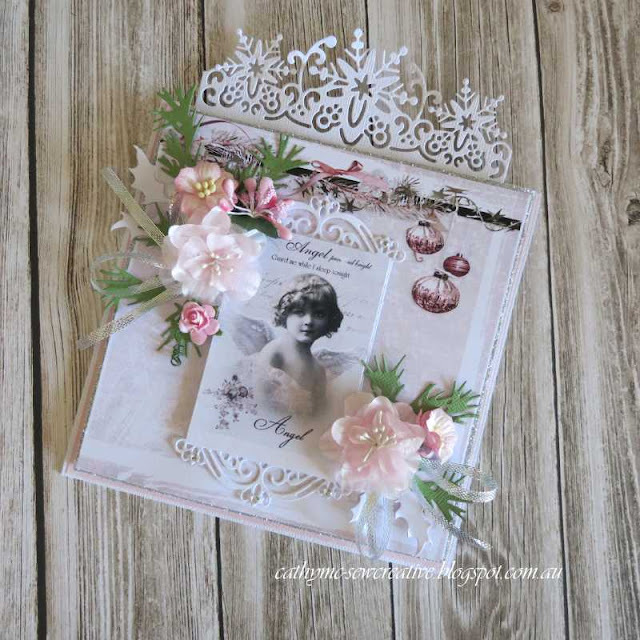 I used this beautiful image from an ephemera sheet which is also available. 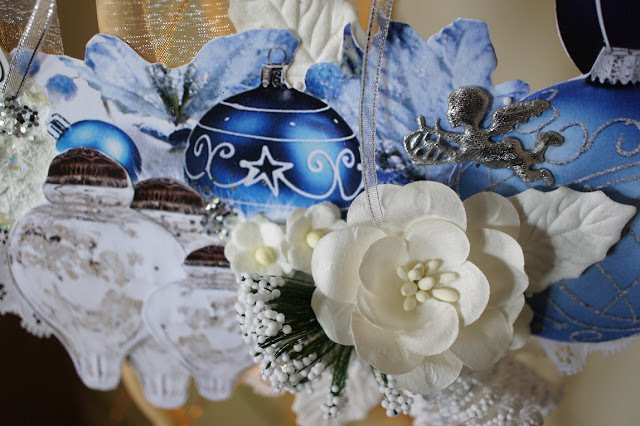 I used Tim Holtz holiday green dies to die cut the foliage to add to my floral clusters. The flowers are from my stash. I recently added to my scrapbooking tools something that I have been pondering over for the last two years...an electronic cutting machine. I purchased a Silhouette Cameo and we are still becoming friends! I used it to create my second project which is a gift card holder. You open it up and slide your gift card inside the white slip box. There is space for stamping etc but I haven't decided what I am going to do with it yet. The file cuts all the pieces and scores everything that needs scoring. Couldn't be easier once you have the right cut setting on my machine! Thanks so much for stopping by Meg's Garden today! 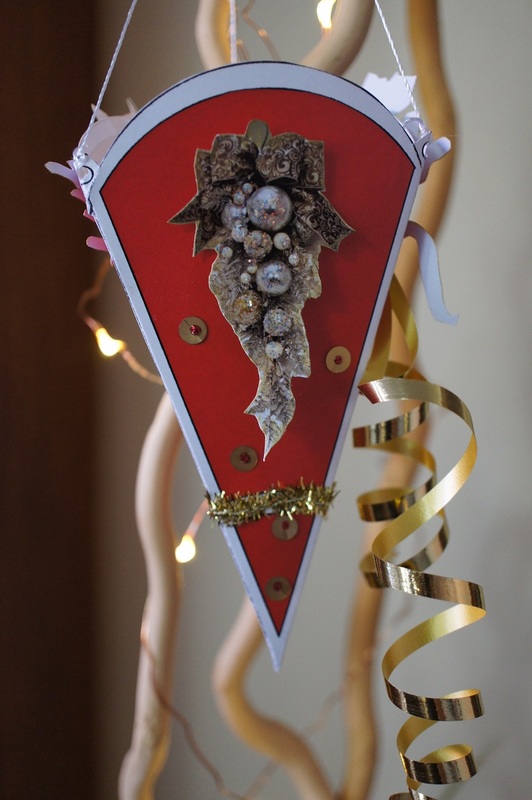 I have created some Christmas decorations you can make to hang on the Christmas tree. The papers are French cones 1086 & acid free Christmas cones 1088. 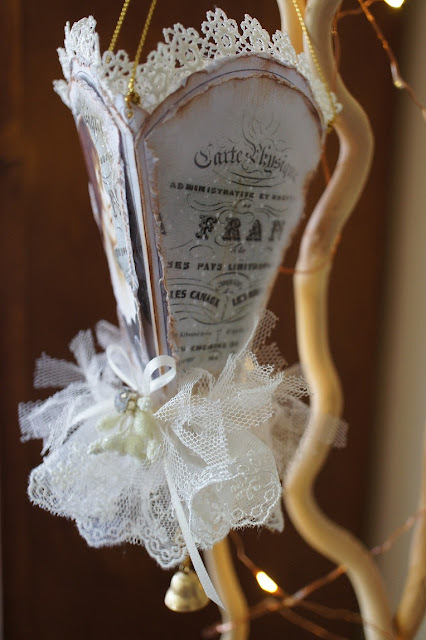 I have also incorporated ephemera pages to cut & create, as well as pretty laces & trims. 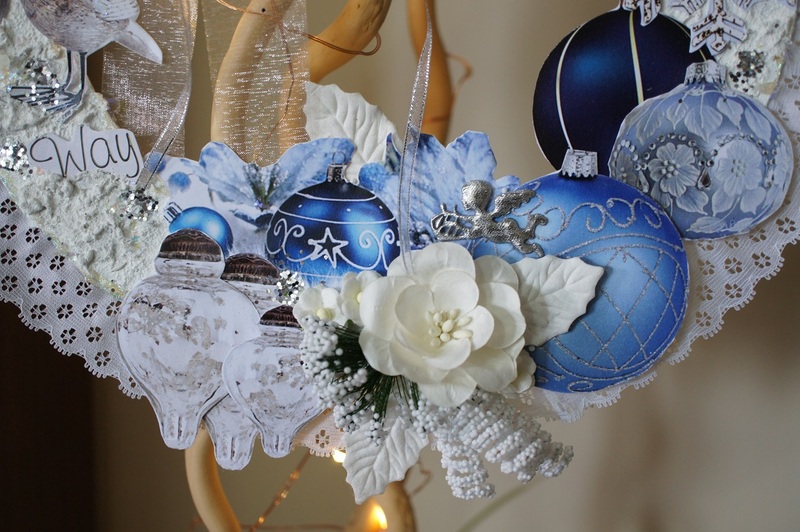 Stop by Meg's online store for all your crafty supplies for this festive season. This vintage style cone has distressed & inked edges, pretty laces, tulle, ribbon, stamens & a cute little bell. You receive two cones per sheet so I have cut each section from one French cone and added foam tape before adhering each piece to my other cone to create a 3D effect. My red cone has been decorated using pretty designs featured from the 'A Twinkling Christmas' ephemera pages. 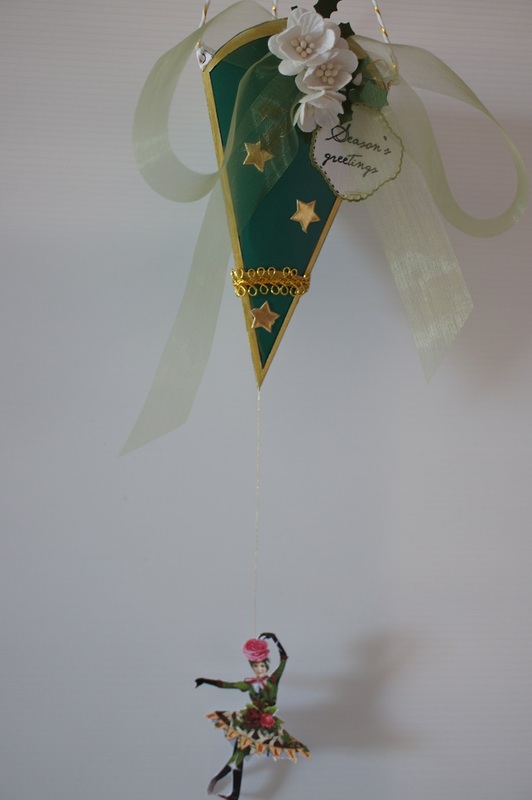 My green cone has been decorated with paper flowers, organza ribbon, gold star trim, & a pretty dancer from the ephemera pages. 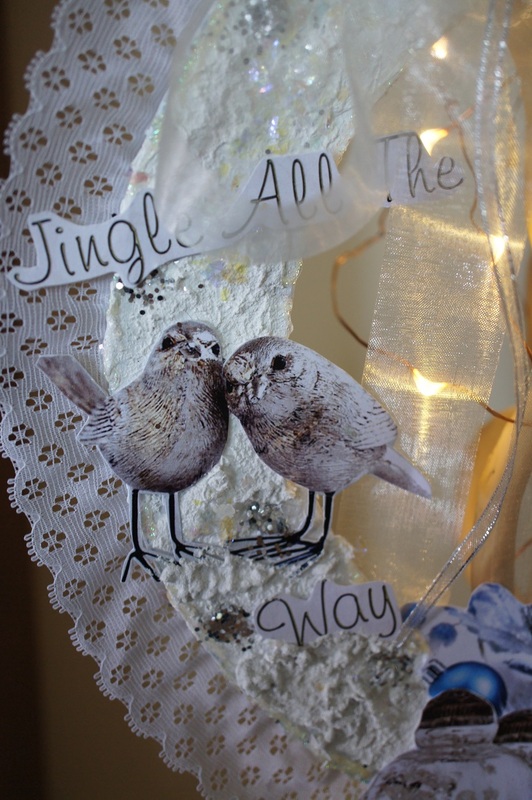 These simple cards have been created using the new Meg’s Garden Christmas Collection called Twinkling Christmas. They are truly pretty and quite different with a vintage feel. When you have such pretty papers to work with, it is easy to create gorgeous cards with just a little layering. This collection also includes pages of ephemera to cut out and use in different ways too, so lots of options. Card No 1. using the 6″ x 6″ card pack papers, trimmed down to size. My finished card is 5 1/4″ x 5 7/8″. I layered the trimmed piece onto kraft cardstock before attaching it to the card base. I trimmed one of the cut outs from the embellishment sheet and also layered it onto kraft card stock and then red cardstock to match the base of the card. I used dimensional foam and a 1/8″ red ribbon tied in a double knot before attaching it to the front of the card. Card No. 2 I think this is my favourite – Another piece trimmed out from the embellishment sheet of these fine ladies, shopping, trimming the tree and generally looking absolutely fabulous. I decided to leave the image together and not to separate it into three individual pieces, as they seemed so right together. I took the dimensions of the trimmed piece to decide on the size and orientation of the card. The base of the card is black card stock to which I adhered the cut out piece. I placed the design towards the top of the card leaving room for the greeting, which is silver embossed. 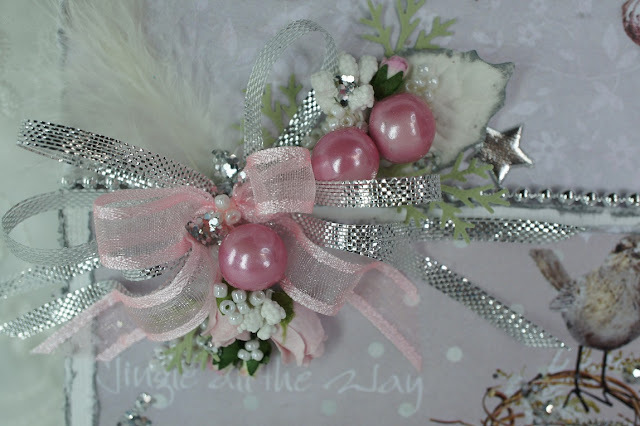 A simple red ribbon bow on the side finishes this card. How simple is that? Card No. 3 Again a very simple card. This card measures 5 3/4″ x 5 3/4″. I thought the background paper was too pretty to cut, but I did trim it down slightly. Again two images trimmed from the ephemera/embellishment sheets are the decorative features. 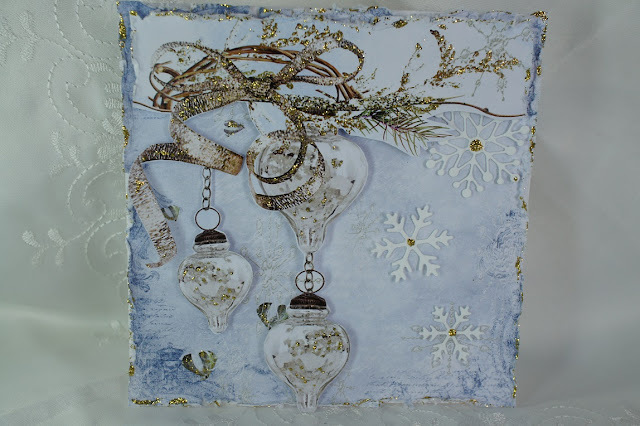 I have used a blue card base and layered the two smaller elements onto the same colour blue. The larger piece is adhered directly to the base while the smaller one has dimensional foam attached. These are the first of this years Christmas cards, and I know, as the next few months get underway, there will be many more. I hope you find a moment to pop across to Meg’s Garden and to check out the lovely “Twinkling Christmas” Paper collections, there are several options to consider. Meg also has some lovely embellishments and ribbons to choose from. 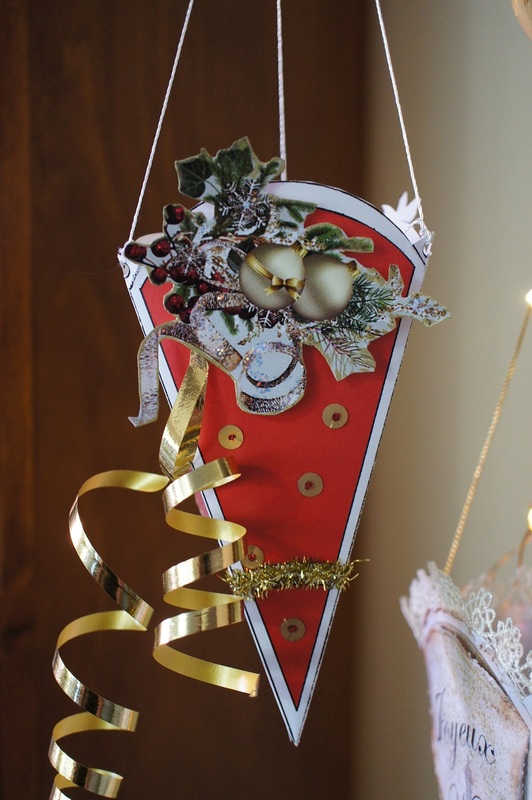 And if you are not ready to do Christmas yet, there are loads of other options for getting your creativity going. Until next time, happy crafting everyone. 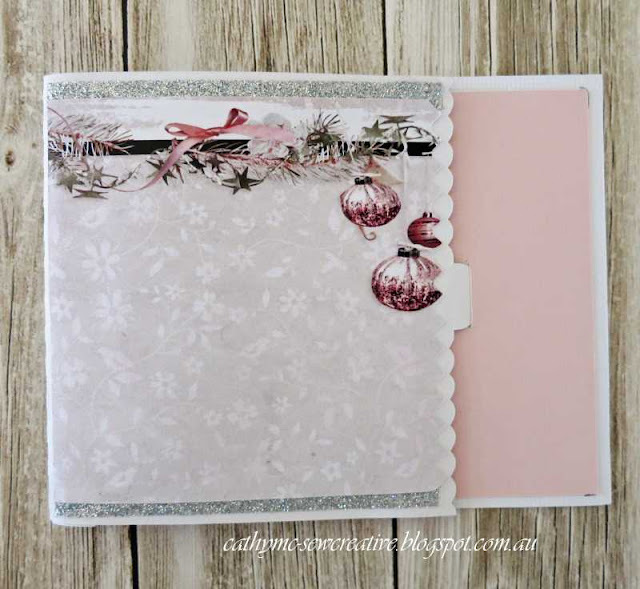 Christmas is getting closer so now is the perfect time to start creating your Christmas cards. 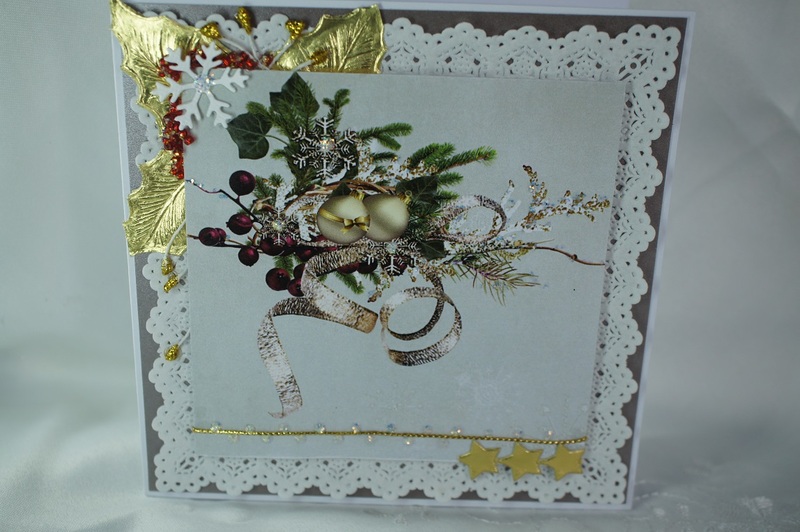 I have created 3 cards using "A Twinkling Christmas S147 12 piece 145mm square patterned paper pack. My cards have been embellished with lace, ribbons, pearl trim, paper flowers, gold & white leaves, gold or sliver star trims, cherub trim & glitter. You can never have too much glitter. I love pink & this card also features silver & white. I have distressed & inked the paper edges to create a shabby chic card. Silver, gold, red & white feature in this simple classic style card. Blue, white & gold, a little fussy cutting, a die cut snowflake & gold glitter create a simple festive style card. I hope I have inspired you to create some Christmas cards for this festive season. 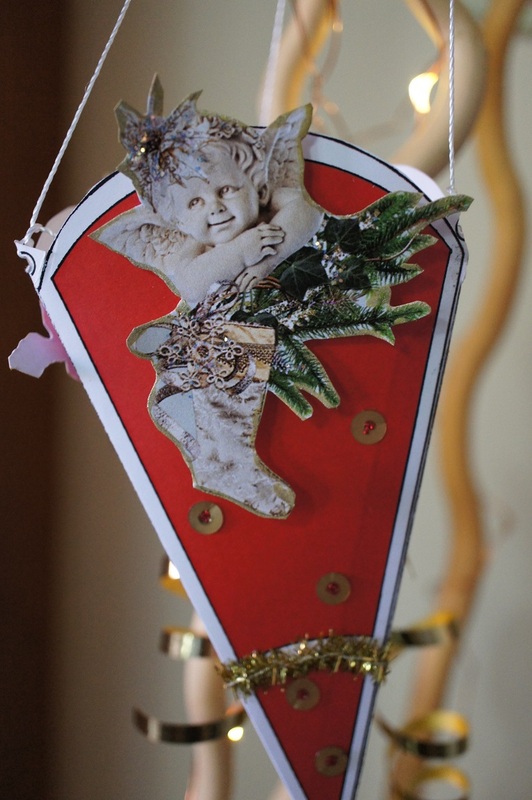 Check out the great Christmas papers & embellishments available on Meg's Garden online store. 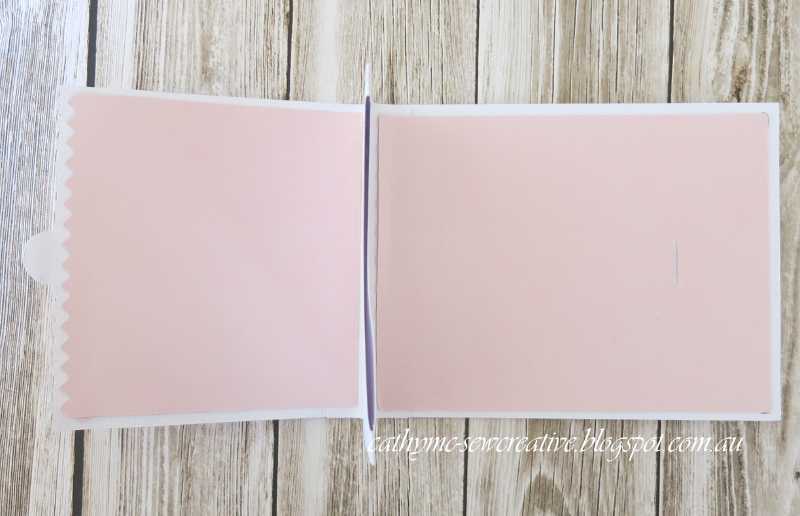 I love making mini books & these are truly minis with only 2 double page inserts. 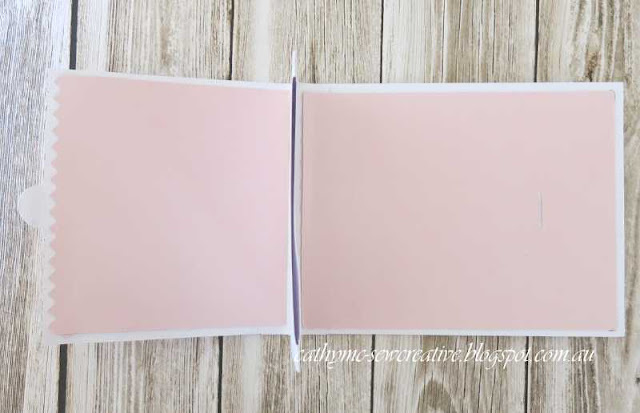 Pale blue cardstock is used on all pages. The cover ephemera is double matted on blue with white. 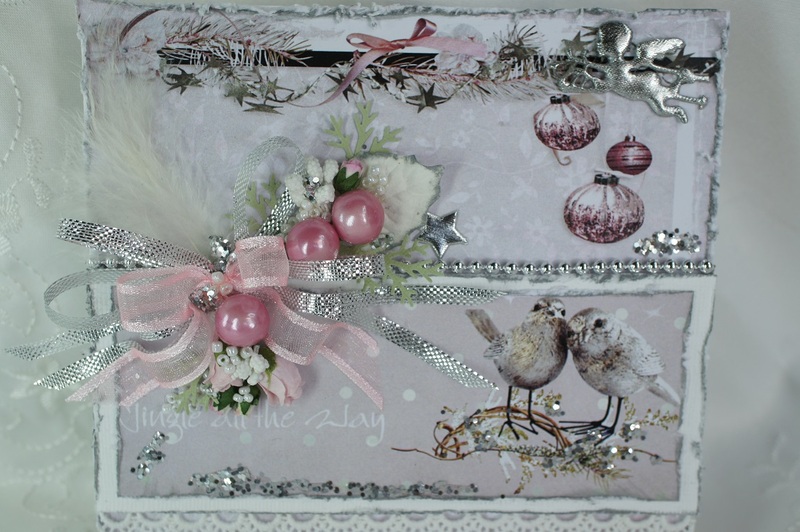 The silver glittered ribbon is placed behind the ephemera (foam mounted) to close the mini book with a bow. When the book is left open the ribbon can be artfully draped. White german scrap is used along the bottom of the entire book.